Have any of these laundry disasters happened to you? If you seem to end up with lots of problems with your clothes after they have a trip through the laundry room, it could be your fault. Perhaps you're not sorting your dirty laundry correctly. Sorting laundry seems to be a mystery to lots of people so they just dump everything in together. But wait, you say you're using one of those detergents and color catcher cloths that claims you can wash everything together? Don't believe everything you read. That's where lots of problems begin. Clothes need to be sorted by color, fabric type, weight, and washing requirements (cold water or hot water). It really isn't so hard. 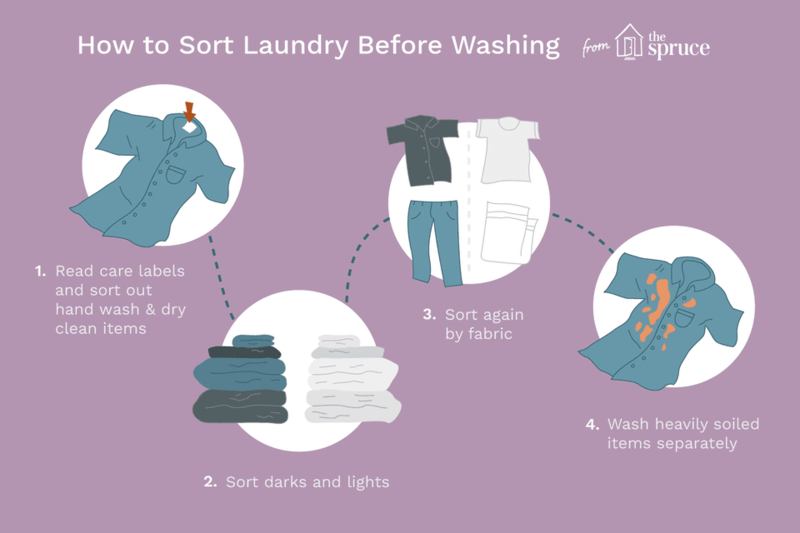 Follow these four simple steps and you will soon be doing laundry like a pro. You can wait until there is a mountain of laundry and the sorting will be tedious. Or, since you know that there will be dirty clothes and linens that need to be cleaned each and every day, you can make it simple by sorting laundry as you take off clothes or use each item. Use separate laundry hampers or a laundry hamper with sorting sections in your closet, bathroom or central laundry area. If the hamper doesn't have labels, you should add them and even post the rules for how to sort laundry so kids can help. One section should be for whites, one section for dark colors, one section for light colors, and one section for dry clean only. Even if you have to do a bit of last-minute decision making when the load is pulled from the hamper, presorting will speed up your laundry routine and help ensure your efforts are successful. Presorting is particularly helpful if you must use a community laundry room or laundromat where space is often at a premium. If you are very familiar with your regular laundry, you probably won't have to do this step every time. But if you are teaching a child how to do laundry, it is a very important step. Read the care label on each item in the hamper. The label will tell you whether an item can be machine washed, what water temperature to use, and how to dry the fabric. Place all clothes that are labeled, “wash separately” or “handwash” into a separate pile. If you are a novice on how to do laundry and see a tag that says “dry clean only”, believe the label and place it in a bag to take to a professional dry cleaner. With some experience, you will learn that some items labeled as dry clean only can be hand washed. You'll also learn how to use a DIY home dry cleaning kit in your dryer. Once the handwash and dry clean only clothes are separated, sort the remaining washable laundry by color. Whites, pastels, light gray, and white background prints will go in one pile. Dark colored clothes–black, red, navy, brown, dark gray–go in another pile. Sort each pile one more time by type of fabric. For instance, in the white/light colored pile separate towels and sheets from blouses, slacks, and underwear or lingerie. In the dark colors, separate t-shirts and jeans from lighter weight items like blouses and dress shirts. If you have dark towels or blankets, separate them from clothes to reduce lint, never wash lint-producing fabrics and lint-attracting fabrics together! Washing by each color and fabric type allows you to use the correct water temperatures and keeps drying cycles simple. Not everyone will need to do this step but if you have heavily soiled items with ground-in dirt or oily stains like motor oil or lots of cooking oil stains, sort as usual but wash these items separately. This will prevent heavy soil from redepositing on other clothing. It will also prevent the transfer of strong odors to other fabrics. Don't make this a habit, but if you don't have enough items to make up a full machine load of each type of fabric and you are in a hurry, you can wash all clothes of the same color together. Just be sure to choose the correct washer cycle and use cold water to avoid damaging the most delicate garments in the load. Just remember, a lacy dark blue camisole won't survive long when washed with a pair of brass studded jeans.